"Annie brings a professional and positive attitude to everything she does. She finds creative solutions to problems that arise and she works hard to provide high quality service to people. Annie’s administrative skills and comfort with public speaking are due to her experience at Point Park University. 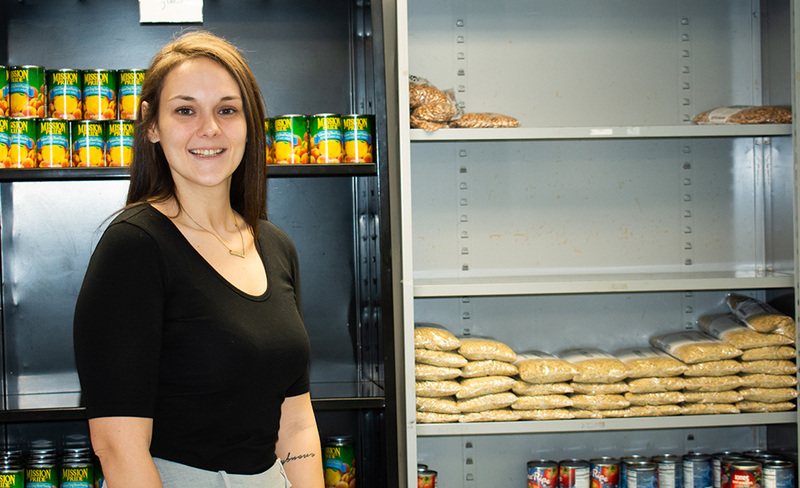 Her ability to understand how the community interacts with itself and the role our organization and her program play also is a testament to what she learned in the criminal justice administration program." How did you become food pantry director for Community Health Services? After obtaining my Master of Science degree in criminal justice administration, I became a case manager with Community Human Services, working with persons to help them secure housing within the Pittsburgh community. During that experience, I saw first hand what many of the social service crisis persons are going through. I realized that I wanted to be more involved within the community and to make a difference within the city of Pittsburgh. I have been within my role for almost two years, and it has been the best! What factors made you choose our graduate program in criminal justice administration? Class size has always been of importance to me. I want to be a real person to my professors, rather than just a number, which is why I chose Point Park University to continue my education. I enjoy having smaller classes so that I can get to know my professor and gain an understanding of the subject being taught to me. The small class size, affordability and easy accessibility to professors and staff made the decision effortless in choosing Point Park. It was always amazing how quickly my classmates and I were able to connect with one another. The best memory for me was how quickly my group of colleagues and I — coming from completely different walks of life — could connect. We became a team and wanted each other to succeed. How have your graduate classes helped you in the work you do? I have always loved learning and realized quickly through the criminal justice administration program the importance of the community. Although some of my classmates pursued careers within law enforcement, for me, criminal justice has always been about creating a community and how we can, as citizens, better it. I have been very fortunate to work for an organization that allows me to share my passions for the community, and to provide services to persons living within low-income situations and experiencing food insecurity. By gaining further understanding about the importance of the community through my education, I ultimately have been able to grow to be a better neighbor and to make an impact in the city I hold dear to my heart. I could not have gained the meaningful experience that I did had it not been for the support and direction of the faculty and staff at Point Park University. Professor Richard Linzer will forever have one of the largest academic impacts on my life, and for that, I am forever grateful.